Feels like it has been a while since the whole family went out together for a meal, thus scheduled to have dim sum breakfast together. The Klang Palace Restaurant-part of the Palace Group is located at Centro Mall, and this is one of the few restaurants that serve rather premium dim sums around Klang. Premium in terms of the taste and quality, which naturally comes with the premium price. On a nicer note, this is 1 of the few restaurant with a little 'UP' ambience around Klang. 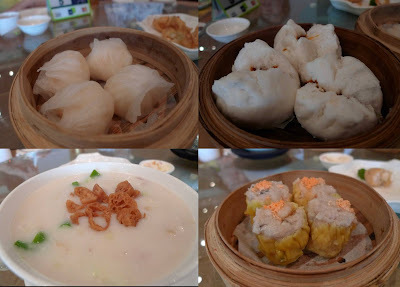 The overall dim sum here is good - the steamed stuff that we ordered were the prawn dumplings which comes with big chunks of prawns, char siu pau with deliciously marinated meat, siu mai which is big enough, and with big chunks of prawn and pork, and as for the porridge, it tasted so so. 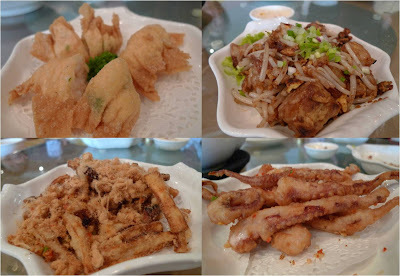 The fried stuff here was good - the deep fried prawn with fruit salad, the fried carrot cake was simply delicious, and 2 of its specialty here are the deep fried squid tentacles with salt, which requires a little chewing to be done, and the deep fried egg plant with chicken floss. No trace of oil used for frying, as the brinjal is really dry, and combined with chicken floss, this is a must-order. This is the first restaurant that made me open up to eating Roasted Pork. The skin was really crispy and aromatic - however, I will try to avoid taking too much of this. Just the thought of it seems to be able to make me gain weight. The steamed rice roll was really thin that we feel like it just melted into the mouth, with small chunks of BBQ pork left to be munched. Think this is a little overpriced though. This is 1 of my favourite - Pork Ribs with Yam. The pork was really smooth, coated with a little of the cornstarch. To be frank, we were only perhaps 70% filled up. Like what people say, we should stop eating before feeling 100% filled-up (apply this clause as and when we feel like just experiencing the food, yet do not wish to pay too high a price for the meal). LOL. 4 Response for the "Centro @ Klang Palace Restaurant"